The yellow fever vaccine was one of the most effective in history and scientists have been teasing apart why, in hopes of duplicating its success. 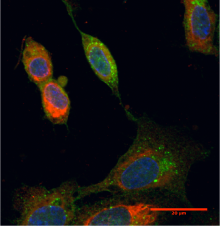 In infected cells, the yellow fever vaccine induces autophagy, indicated here by the presence of green speckles. Red indicates vaccine antigens. Scientists at Emory Vaccine Center have found a link between immunity induced by vaccination and an ancient way that cells adapt to scarcity, a link that could help researchers develop vaccines against challenging infections such as HIV or malaria. Researchers studying immune responses to the yellow fever vaccine – one of the most effective in history -- identified a gene whose activation in key immune cells is a sign of a robust response. The gene, called GCN2, encodes a protein involved in sensing amino acid starvation and regulates the process of autophagy, a response to starvation or stress within cells. The results, published online Thursday by the journal Science, shows that GCN2 is critical for the induction of immunity to the yellow fever vaccine, and suggest that vaccine additives (called adjuvants) that are effective in stimulating GCN2 and autophagy would be especially potent in stimulating long-lasting immunity. "This reveals an unappreciated link between the ancient starvation response and vaccine-induced immunity, and highlights the power of system-wide approaches in revealing new insights," says senior author Bali Pulendran, PhD. "We were not thinking about the stress response pathway and immunity until our analysis pointed us in that direction." Pulendran is Charles Howard Candler professor of pathology and laboratory medicine at Emory University School of Medicine and a researcher at Yerkes National Primate Research Center. The co-first authors of the paper are postdoctoral fellows Rajesh Ravindran, PhD and Nooruddin Khan, PhD. The yellow fever vaccine was developed in the 1930s and has been administered to more than 500 million people. A single dose of the live attenuated viral yellow fever vaccine can protect against disease-causing forms of the virus for decades. Investigators led by Pulendran have been dissecting immune responses to the yellow fever vaccine, taking a genome-wide "systems biology" approach. They started by looking at all the genes that are turned on a few days after human volunteers were vaccinated against yellow fever and asked: which genes’ activations are the signatures of especially strong immune responses later? In particular, Pulendran and his colleagues looked for responses by CD8 killer T cells, which are important for eliminating virally-infected cells from the body. One gene that stuck out was GCN2, because it was induced quickly after vaccination and was a sign that the immune system would later respond with lots of CD8 T cells. GCN2 was known to be a sensor inside cells that detects low levels of amino acids, the building blocks for proteins. GCN2 regulates the process of autophagy, in which cells respond to starvation or stress by ceasing growth and beginning to digest themselves. In the Science paper, Pulendran and his colleagues show that GCN2’s function is especially critical in dendritic cells, whose job is to "present" information about viruses and other pathogens to the rest of the immune system. Dendritic cells lacking GCN2 are less able to activate CD8 T cells, and mice that lacked GCN2 had impaired responses to yellow fever vaccine and to inhaled influenza vaccine, the researchers found. They also found that infection with yellow fever leads to a depletion of amino acids within dendritic cells. When viruses infect dendritic cells, it appears that the viruses start using up the building materials on hand. This tips the dendritic cells into autophagy and raising an alarm with the rest of the immune system, Pulendran says. "This may have evolved as a mechanism of pathogen sensing that is capable of detecting the footprints of a pathogen, such as depleted amino acids in a local microenvironment," he says. The research was supported by the National Institute of Allergy and Infectious Diseases (R37 AI048638, U19 AI090023, U19 AI057266, U54 AI057157, N01 AI50019 and N01 AI50025), the National Institute of Diabetes and Digestive and Kidney Diseases (R37 DK057665), the NIH Director’s Office of Research Infrastructure Programs (Primate centers: P51OD1132), and the Bill & Melinda Gates Foundation. Reference: R. Ravindran et al. Vaccine Activation of the Nutrient Sensor GCN2 in Dendritic Cells Enhances Antigen Presentation. Science DOI: 10.1126/science.1246829 (2013).